Guy & O’Neill boasts a customer-focused culture. We are dedicated to the highest possible standards of customer service, quality, price and delivery. Everyone at G&O is willing to go above and beyond to exceed the expectations of our customer. The environment is very collaborative with high degree of personal accountability and ethical behavior. We invest in our employees — they are our greatest assets — and everyone genuinely cares about one another and our collective success. 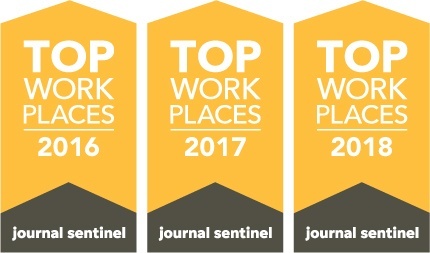 G&O was recognized as a Top Workplace for both 2016 and 2017 in Southeastern Wisconsin, based on surveys filled out by our employees. We are all dedicated to the company’s core values — values that not only are appreciated internally, but also are important to our private label and contract manufacturing partners. Interested in joining the Guy & O’Neill family? Contact us today: hr@guyandoneill.com or 262-692-2469.